Stout, stout, stouty stout stout. 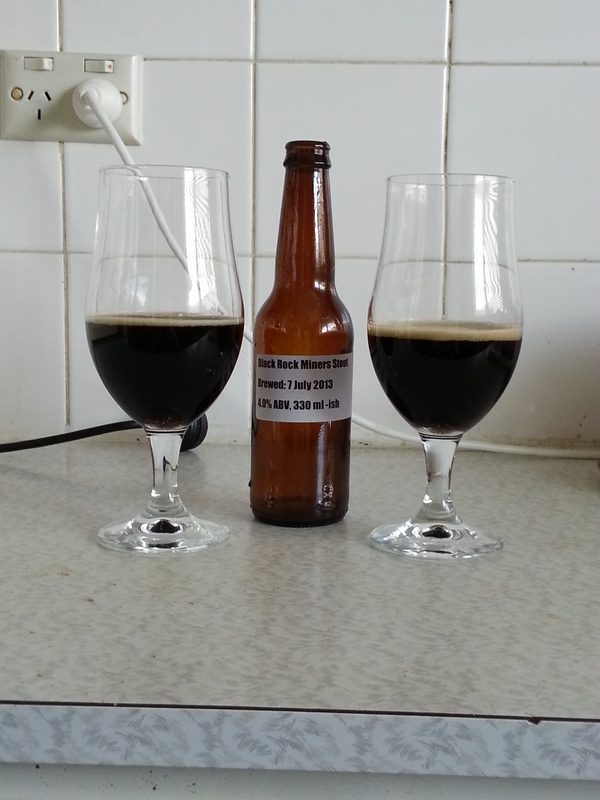 Yesterday we tasted the Black Rock Miners Stout in addition to doing a brew that I’m sure Mikey will write up. We also tasted the Gauss’ Law Hopped Cider as well as Mikey’s Australian Pale Ale. Reviews of these will be coming as well. First of all, it looked very much like a stout. Very dark, decent head while pouring, although the head retention was lacking a little bit. Unfortunately there wasn’t a whole lot of aroma; the aroma was there, but quite very subtle. I wasn’t able to get much out of it, but there were hints of brown sugar, chocolate, general sweetness and some malt and sticky smells as well. There wasn’t much in terms of overt hops smells, but that is where some of the sticky sweet may have been coming from: floral mixing with the malt perhaps. On the first taste, it was apparent that this is a weaker stout of 4% ABV with very little body, especially for a stout. The subtle chocolate flavours continue as well as the subtle malt flavours, but other than that, the flavour is just “there.” There wasn’t much to put my finger on, nothing obvious coming out to set it apart. All the fairly standard stout flavours were there, but nothing to talk about. Overall, it’s a good beer, but not great. It’s very accessible but very middle of the road. Because of this, it would make a fairly sessionable stout. It would also make a good introduction to stout for those who don’t usually drink it. In relation to food, these heavier beers generally go with heavier, meatier dishes, and this is no exception. I think stouts are always good with barbecue, but I’d reserve this for a barbecued white meat like chick. I also think that this stout is light enough to enjoy with a relatively hardy pasta with a good thick red sauce. Yes, this beer isn’t exactly what I was hoping for. Really wanted a fair bit more body, and alcohol. At 4% I’m not sure if it’s right to call it a stout. Anyway, the flavours are there and this is something to return to with more fermentables to be added. Side note, the conditioning on this is quite long. Really have to maintain the temperature above 16C for a full four weeks before this can be enjoyed.